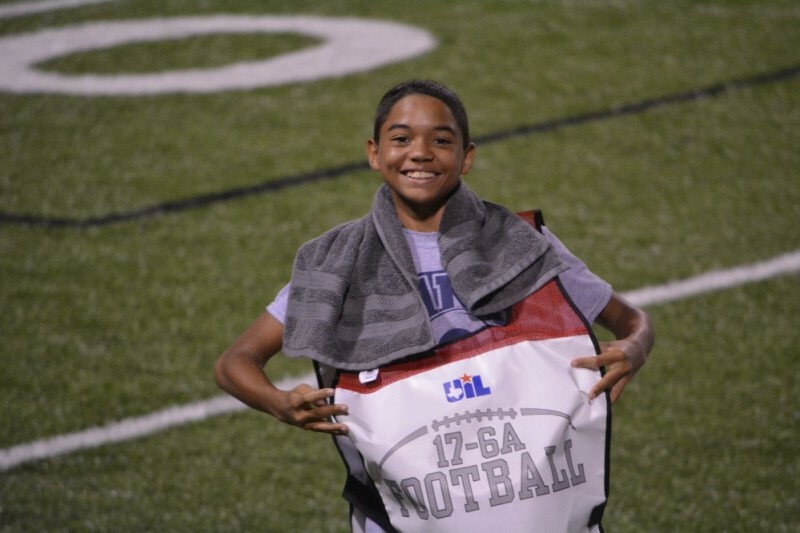 Michael John Riley Jr. is an amazing 14 yr. old young man who loves his family, is a great student and talented athlete. He qualified for Junior Olympics three times, is in the National Honor Society and WITH A MUCH NEEDED MIRACLE has a great future ahead of him. After getting back from Sugar Creek Baptist Church camp in early August Michael was ready to continue his cross country training by running 12 miles a day. On Thursday, August 13th he enjoyed a wonderful sunny day by going on an annual school trip to Sam Houston State Park with his new high school track team and coach. ‘The boys ran, did strength exercises and swam in the lake throughout the day. That weekend was spent with family and friends hanging out and preparing for a track meet, and back to school activities. Just barely a week later, Wednesday August 19th Michael woke up with a headache and slight fever. Being cautious Michael’s mom Cassandre took him to a local clinic, but they didn’t find a clear sign of what was wrong. Thursday his headache got a bit more intense, he had less energy but was still able to go with dad, Michael, to get a haircut and be ready for his first day as a freshman in high school. Friday was not only a rainy and miserable day in Houston but for the Riley family it was one that will never be forgotten. Our Michael took a turn for the worse, he was visibly disoriented, had an unbearable headache and his neck hurt much like meningitis symptoms. Mom and Dad immediately got him to Texas Children’s Hospital (TCH) – West Campus where thankfully their attending doctor made the connection with a different case from only 3 weeks before with the same symptoms. TCH performed many tests but also a ran an uncommon one that would help diagnose that Michael had contracted a brain eating amoeba called Naegleria fowleri which then causes a rare disease, Primary Amoebic Meningoencephalitis (PAM). We have now come to understand that the amoeba entered Michael’s body when he JUMPED in the LAKE and WATER was forced into his NOSE. Although VERY RARE it is more likely to occur during and after HOT SUMMER MONTHS. The amoeba attached itself to the nerve that goes to the frontal lobe of the brain. (see below for a more thorough description). Knowing the severity of his condition TCH immediately transported Michael to Texas Children’s Hospital in Houston’s treasured Medical Center. Many medical experts are involved and an experimental drug from the Center for Disease Control (CDC) which was flown in from Atlanta and is being administered to our Michael now. We are thankful to be living in this great city. Upon arrival the amazing medical team from both hospitals have worked tirelessly to keep our little guy comfortable and well taken care of. He is in critical condition and every hour is a waiting game to determine if he will pull through. The odds are not good but with our family, friends and community, the family’s Lakewood Church and all of the insurmountable prayer we KNOW God is healing our baby’s body. We will be using this site to keep everyone updated and most importantly to CREATE AWARENESS to as many family’s as possible. Please be EXTRA CAUTIOUS and EDUCATE yourselves on the risks of PAM. Although this is a VERY rare situation and circumstance the hot summer months breed the danger of this amoeba. This is now the 2nd case within the past month in the Houston area. Please, please, please educate yourselves. There is only one success case that we know of in Arkansas...we are hoping we will have the same story to tell very soon. We do not know the road ahead for our family but we are praying for a long one instead of a short one. From one hurting family to another. Just a few weeks ago we lost our beloved angel, to a similar case like this. Unfortunately it was too late for her & for the doctors to do anything. I pray to god may he heal this young boys body. Prayers out to the family. I did a research paper on this for my MSN in epidemiology. The only survivor with no long-term brain issues was treated with 2 CDC drugs and hypothermia. How can I post my research on here? So sorry for the long post, but I am a mother of an 8 y/o boy. I felt compelled to share this info with the family. My hopes and prayers are with you. WOW what a testimony...fall asleep here on earth & wake up in our Heavenly Father's arms. For the family left behind please listen on YouTube to the song Wonderful Peace, for this is my prayer for yall. God bless & I look forward to being with yall in Heaven. I'm terribly to hear about the loss through a recent update. My prayers are with the family and friends. I know what it's like to lose a loved one. May his memory live on. God bless and keep you all. To the Family of Michael: There is a Healing Pastor in Argyl Texas that can heal little Michael. His Name is Thurman Scrivner. at The Living Saviour Ministries. Look him up on You Tube to see the great healings he has perforemed in the Name Of Jesus. He is the real deal, If you want someone that Can say "I Guarantee you are healed in the name of Jesus"Please do not delay and contact him at the following e-mail tls_ministries@hotmail.com He will not charge you anything. God Bless and Keep you in the Name of Jesus. Am sending my prayers and hope; Kelly - thank you for posting the information below! Michael's condition is being treated by his doctors, and they have to make decisions of risk / benefit, in a condition where all treatments are experimental and standard treatment was a 1% or less success rate. PLEASE : Someone ask the treating team to Google (or use Medline) and search for the following phrase : 'Chlorpromazine Naegleria Fowleri'. This is NOT medical advice... but the treating physicians MUST be aware of the results of this search, and MUST read the peer-reviewed journal articles that dominate the first page of Google, and Medline / Pubmed, and decide if it is either relevant - or not - only they know his case in detail. Someone please tell them!!! Kelly - I wish there was a way to discuss this with you further as well. Sending my prayers for Michael and his family; hoping for the best! in honor of your wonderful son Michael. God Bless You Michael. And you Matt for helping this child!